Em's Knitty Corner: Another update! Ok, I know, I promissed to update more often (or didn't I?). Well, I still plan on doing so. I have taken the weekend "off" from anything possible happening in order to get some quiet time, mostly for napping and relaxing. I have so little energy these days. I still am not able to keep going when it's getting really busy, so I guess my body still needs a few more weeks (hopefully not months) to recover from this cronique fatigue (not the big thing, just some kind of long term fatique). 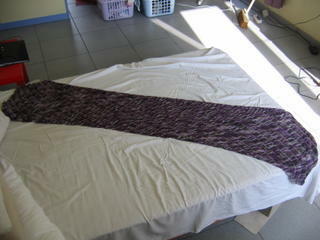 First of all, finished 2 weeks ago, I present to you, my Clapotis!! Stretched to full lenght on my bed (stripped from the sheets, those are in the washer right now). No, it's not blocked, and right now I'm not planning on as it's fine as it is. 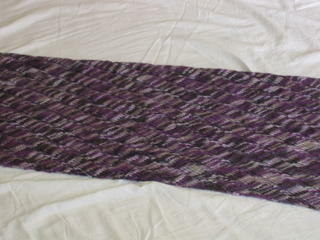 Time : a few months, started in May or so but it was to hot over the Summer to knit much on this. Conclusion: the yarn is super and the pattern is nice, planning another scarf but smaller. The feel of the yarn is so soft! Can't wait to start using more! I already added some to my stash! The pattern is nice to and I will be using it again in the future, probably with self striping yarn as I saw on other blogs that works really well too! Ok, the colours are way off, it's much darker and there's quite some purple in it. I'm looking forward to knitting with it. Nope, I'm not kidding. I knew there was something wrong when I could see a cut thread in the skein, so I decided to rewind it. I was hoping to just end up with 2 skeins. I could wind off about 1/3 of the skein just fine. Then I could one off the 2 smaller balls you see at the top corner (right), but then it started tangling and this is what I ended up with! 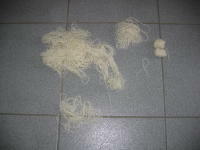 :( It's still on the floor of my yarn room in the hopes I find some energy to untangle it further. 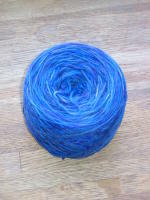 I can use the small skeins for test dyeing and then for fair isle socks, if I ever get through the pile of tangle there. Well, what do you think, should I contact KnitPicks about this? 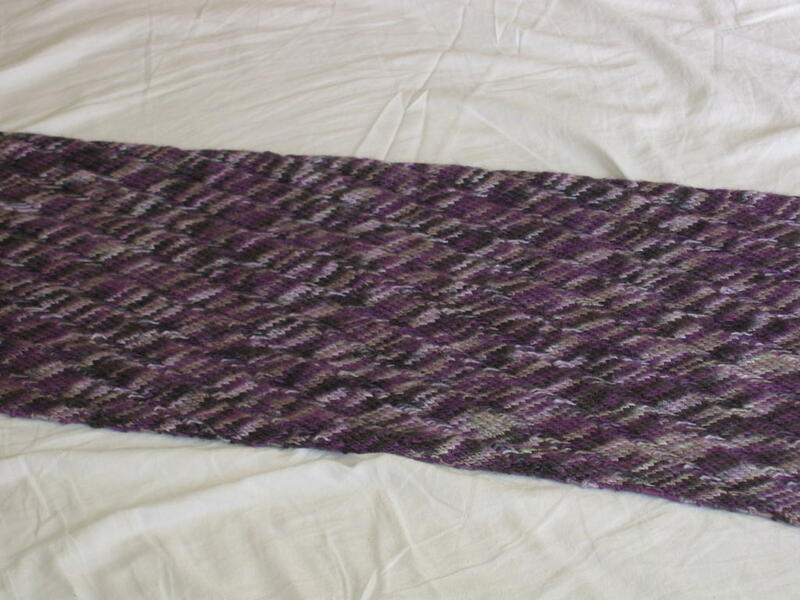 As far as I could see all the other skeins are ok so I guess this one just got cut or something. I unfortunately did not check the plastic bag the skeins were in and threw it out before this happened. Ok, this is enough for now, I'm off to grab some food and watch some tele or something like that! Love your Clapotis - have just started my own one! Everyone that makes one seems to talk about making another one - but smaller.....what do you think?